Since I hadn't heard of the non-profit and he didn't respond at the time, I couldn't confirm right then that he was a genuine emissary of the group. (But in retrospect, that appears to be the case.) And eventually, my attention wandered over to a man with a pompadour and limited English skills at the edge of the skating rink, who had needs of his own. I said hello and asked AcereroBen Rothlisberger what was up. AcereroBen Rothlisberger: ok ya me entiendes? Translator v1.6: ok already you understand to me? "Yes!" I wrote back. "Now I read it in English!" 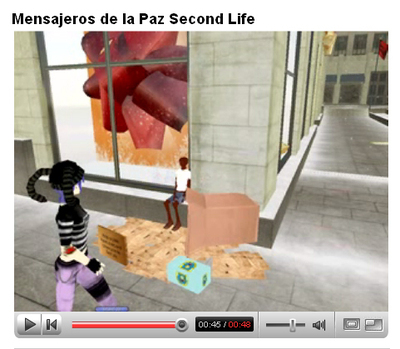 "I hope it helps you in Second Life." So from there, we were able to talk about many things, such as Oaxaca and the state's current civil unrest, and whether I should visit. I told him I hoped so, and offered him friendship as I got ready to go. I offered him a hug from the USA, and that's right about when I took leave of my new acquaintance from Mexico, standing there next to the avatar of an unspeaking homeless child from a Spanish charity on the digital Manhattan sidewalk paid for by the National Broadcasting Corporation. Update, 12/5, 1:20PM: I just contacted representatives with NBCi, sponsors of the Second Life site, asking them about the homeless avatar begging on their virtual property. Will post any reponse they send here. Sounds a lot like the real NYC. No, if it was the real NYC, Ham would have ignored the homeless guy (who would have been arrested for sitting there in the first place) and cursed out the clueless tourist for blocking his way. I didn't realize there were so many Pittsburgh Steeler fans in Latin America! Did you hear back from the NBCi at all? It's awesome that you went further and made a contact with NBCi. Please share what happened afterwards. it would have made NBCi so cool if it took the effort to engage on that topic. thanks for your reply. This is just the details I am discovering everywhere. Thanks for your site, I just join your site.